Interested in raising a family in the Texas Hill Country? In our newest guide, we provide you with everything you need to make the best decision for your family. Understand the benefits to investing in Texas real estate and learn tips from the pros on choosing the best home or homesite for your family. 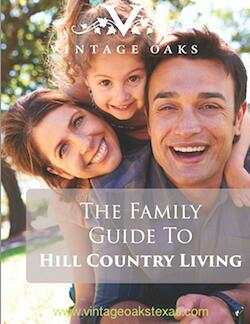 This guide was produced by the experts at Vintage Oaks, the fastest-growing community in New Braunfels. To download the guide, simply fill out the form. You will then be directed to open a PDF version of the guide. Vintage Oaks is a 3,900-acre master-planned residential community located in the Texas Hill Country in New Braunfels, TX, between San Antonio and Austin.